Chocolate always makes things better, or so Emily Harris believes until even a dozen boxes of her favorite chocolates can’t put her world back together. Returning home from a trip to New Orleans, she is pushed down the airport’s arrival escalator, and despite evidence to the contrary, she believes the push was deliberate. If this weren’t enough her lawyer husband begins to act strangely, her oldest son brings a tramp home as his girlfriend, and two friends are murdered. Simple sayings from her childhood thread their way through her thoughts as she struggles to identify the common denominator, even as she is confined to her home, munching on chocolates. 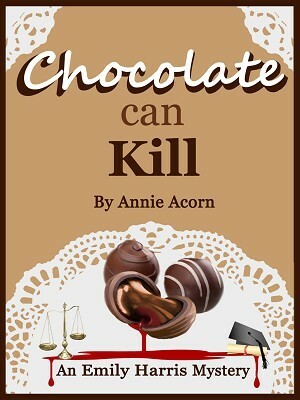 Filled with the warm southern ambience and gentle humor that author, Annie Acorn, has made famous, you won’t want to miss this cliffhanger!